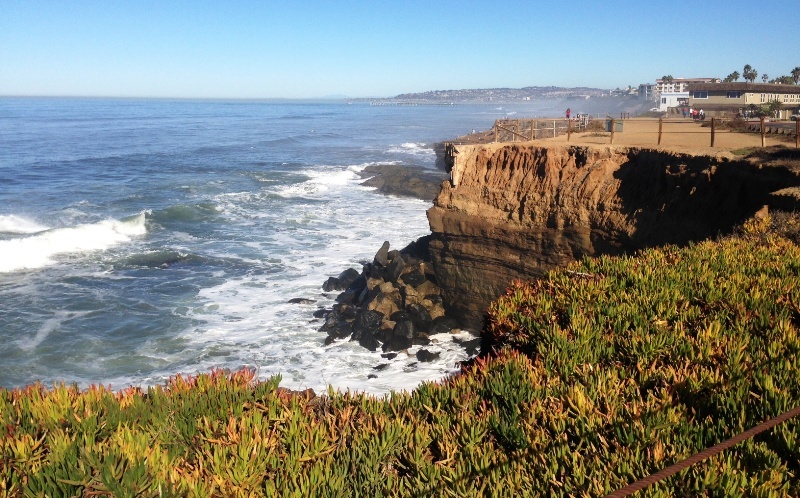 The news of graduate student Anna Bachman falling to her death from Sunset Cliffs while apparently taking a picture on Sunday is truly tragic for all OBceans. Who among us has not been to the cliffs and probably gone a little too far in order to get the perfect view of the sunset or perfect picture to share with our friends? The fact that it was a woman who was living in Chicago that died hits even closer to home for me. I’m a somewhat recent transplant from the Windy City, having transplanted to our beautiful beachfront utopia in the past year. Since moving here, we have had a number of visitors from Chicago and the Midwest. We had guests visit over the holidays and took them to see what has to be considered one of the best sunset views in the world. We couldn’t have been more than a few yards from where Bachman fell. Fortunately, we kept a somewhat safe distance as my friends took their dazzling pictures. But we could have easily tried to get one fateful step closer to make the shot that much better. Chicago is an amazing city. I spent more than a decade there and in many ways still consider it my home. It is different from California, and San Diego, and especially Ocean Beach in so many ways. While there is some spectacular scenery, I can tell you Chicago has nothing like the Sunset Cliffs. But really, who does? Chicago gets really, really cold. Southern Californians who haven’t experienced it would have a hard time imagining the feel of sub-zero temperatures. You may have heard of the recent “polar vortex” that engulfed Chicago and most of the Midwest – hell, it seemed like it had a hold of pretty much everywhere in the country but here. That no doubt will draw more visitors to our area. I know our guest room is getting a workout and has more visitors from back home on the way. I want to show our visitors how amazing things are here. I’m sure we all do. But let’s please take this as a warning to respect our surroundings. We see on an almost daily basis, that if you trifle with Mother Nature, she will mess you up. We have the opportunity to show the rest of the world just how amazing this place is. Let’s not get overzealous in our quest to document this amazement. I want friends and colleagues back in the Midwest to learn about the wonder and excitement of our community instead of the tragedy that comes from pushing the limit too far. pro-tip – your picture will look just as good standing 15 feet from the edge as it would if you were right on the edge itself. Agreed. It’s just not worth it. Those cliffs are dangerous! Who among us has been into the Smuggler’s Cave within the bluff adjacent to “the arch” at the foot of Osprey St.? I have about 20 years ago, during low tide you drop down into the cove, walk around and enter the cave. At the lowest tide the water was about knee deep, if you were in there when the tide was high or large waves breaking you could easily be killed as they would just pound you into the back of the cave. The waves would be timed so you’d try to swim from the back of the cave and before you got to the opening you’d be pushed back again as the next entered. If it were big enough at high tide there would be no air left to breathe. Your fate sealed in Davey Jones’ locker. The cave is easily large enough for a medium sized powerboat to enter and moor. At the back of the cave was a set of stairs precisely carved into the sandstone leading into the darkness up in the bluff, as you reached the top you entered a tunnel heading east with holes in the tunnel floor where you could see the surf crashing in below you. There was a false tunnel heading to the northwest at a junction, following the tunnel just to the east there was an alcove dug into the wall with a candle burning- probably a 7 or 8 day candle. It was the only light source, we’d brought 2 flashlights each, the minimum for any cave exploring. The tunnel stopped another 100 feet or so up the bluff, where it had either collapsed or been filled in by the residents of its former destination- which my experienced guide told me legend held was the large house at 1203 Sunset Cliffs. Again this was 20 years ago, my friend/guide was pretty scared even back then due to the deterioration of the bluff from surf, it’s probable a lot of what I saw then now may not even exist. Then again that alcove might still hold a burning candle even today. I’ve jumped off the arch hundreds of times from both high and low edges, and have even taken a few plunges from the spot on the street side that’s around 40-50 ft high and you have to clear a good 10 feet of rocks to hit water. It’s always a good idea after any period of heavy surf or for the first jump of the summer, to wade in first and walk around to ensure no boulders have unexpectedly moved to where you don’t want them. I’ve jumped from the high spot into about 6 feet of water at lowest tide mark BTW, wearing shoes and if you know what you’re doing it’s not a big deal. Why am I sharing all this? To express that the area is perfectly safe, even for activities far more risky than taking pictures, if you keep your head out of the fudgesocket. My sympathies and condolences to those who can not. Wow, you got a quadruple negative! One for not being sensitive to a grieving family, One for giving away the location of a “secret” spot on the internet, One for being gross and referencing a “fudgesocket” and One for tooting your own horn about how awesome you are. Nice work. recently I’ve really wanted to go check it out and take photos. I’ll hike down there with cameras and flashlights. but not until the tide cycles flip back. you don’t want to get caught in there when the tide is coming in. Rumor has it that the tunnel which John found to be either collapsed or filled in was a rum-running conduit that was used for smuggling booze from Mexico during prohibition. Very interesting to learn about John exploring the underground caves of the Cliffs. Older Article: The United Nations in My Closet.